Most of you will know that I am a stay at home home. I absolutely love it and am so glad I have this opportunity to be with Piglet while he is still so young. The problem with being at home, though, is our financial situation. We have had to adjust to one salary, and that can be tough. Don’t get me wrong – we are not struggling. We have a nice house and a nice car and our bills are paid. However, we don’t seem to have much leftover at the end of the month. 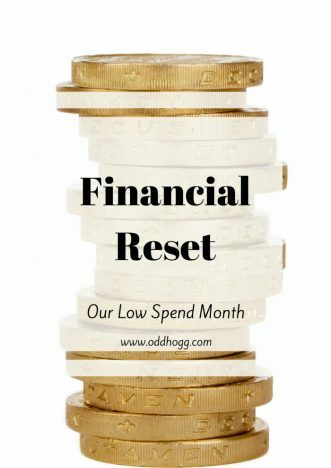 We both know we need to make some changes so we can start building up the savings pot, so this month we’ve decided to have a bit of a finances reset. The decision to be a stay at home was one that was made for me, rather than something I initially chose. I was made redundant from a great job as a mechanical 2 years ago, and discovered I was pregnant with Piglet shortly afterwards. We went from 2 salaries, to 1 with a baby on the way. And then we decided to buy a new house too, because we’re a glutton for punishment! We used to love eating out a lot. Popping out for a coffee, getting a take away. Go to the cinema, have weekends away. We didn’t feel the need to watch the pennies as we had enough. I have to admit we haven’t changed our ways much, but with 1 income it is time to make a change! I already meal plan, and it’s a great way to make sure we don’t order a take away. JHogg and I are both guilty of adding little extras to our shopping though which we definitely don’t need. So we’ve set ourselves some “rule” for this month. Stick to the shopping list – no sneaking in chocolate yoghurts or unnecessary Easter eggs. No booze – I don’t drink very often anyway, but JHogg does. He always having beers at home, or spending lots on nights out with the boys. Apart from 1 pre-arranged evening he is off alcohol for the month. It will be good for both his health and the bank balance! No takeaways – We’re guilty of a last minute pizza order. It’s off the menu in April! 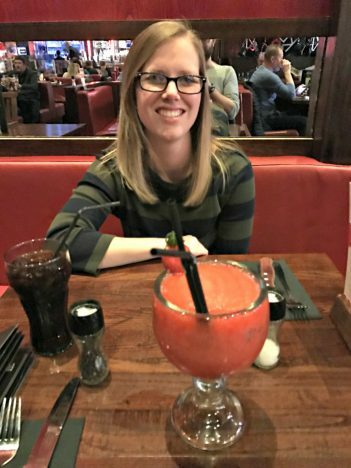 No eating out – We have some clubcard vouchers which we can exchange for restaurant vouchers, but other than that eating out is not an option. Again, there is a pre-arranged dinner for my sister’s 30th which we will of course go to! No “quick coffee” treats – Stopping for a coffee became a habit when I was breastfeeding Piglet and we had to stop off regularly to feed him. Those days are long gone, yet we’re still often found in a Costa. If you see us there then send us home! No impromptu purchases – Amazon is my friend and a spur of the moment purchase is way too easy. We are really hoping to get away on holiday in May, so if we stick to this plan we should have some pennies left over at the end of the month for holiday spending money. We also hope that if we’re not going out as much at the weekends we’ll get some big chunks of DIY done at home! By the end of April we should have a better grip on reality. I don’t expect to never eat out again, but this month should help us reduce the number greatly! Have you ever taken some time to have a finances reset? Do you have any tips for us?